I blame it on the Garden Club, and the first (and only) garden tour I went on with them. 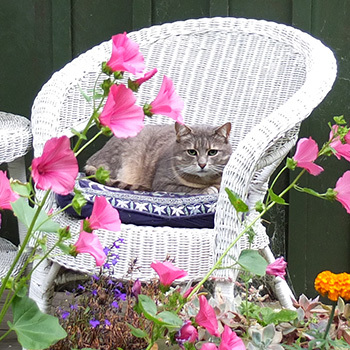 An old cane chair, painted white, in a secluded outdoor nook, complete with nonchalant pot of pelargoniums. This was THE look! I saw this pretty 'outdoors' seat on a visit to Cloud Farm near Akaroa. 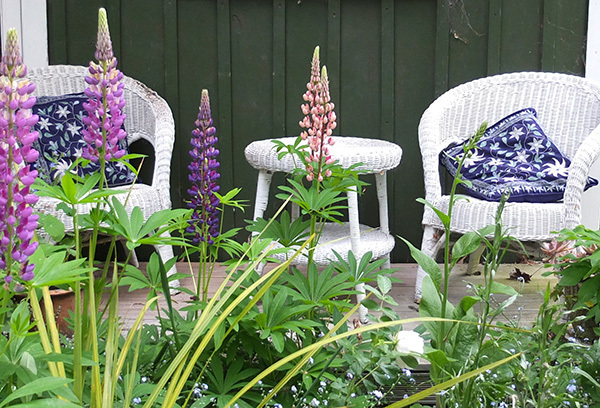 So during the next months I collected various cane chairs from the Charity shops, and placed them in my own garden, just so. So cute! This was definitely THE look for me. But, as anyone with any sense would know, it was not a weatherproof look. I gradually found this out. But people? Oh dear. 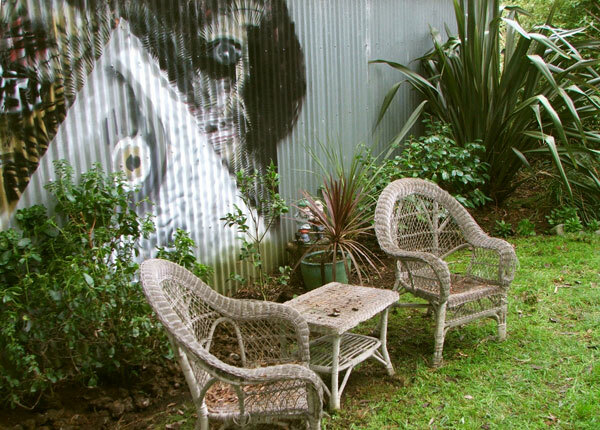 One day I watched a rather large garden visitor sink slowly into the white cane chair on the house patio. And sink - and sink even further. It was a slow demise, as the cane legs slid ever outwards. Oops. 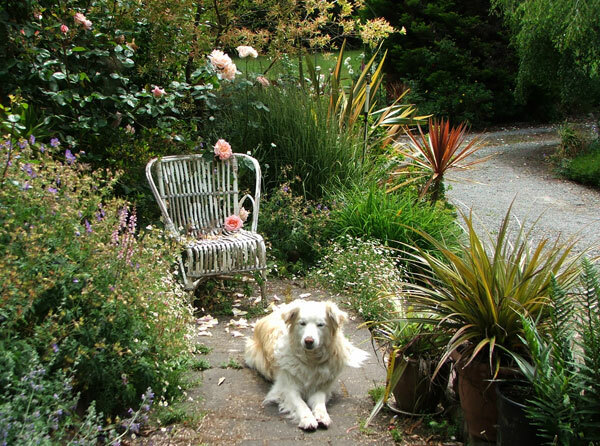 But still I persevered with this seat, and all the others dotted about the garden. For safety's sake I placed pots on the really rickety ones (some garden visitors don't have the sharpest eyesight). Everything looked oh so pretty in my photographs. 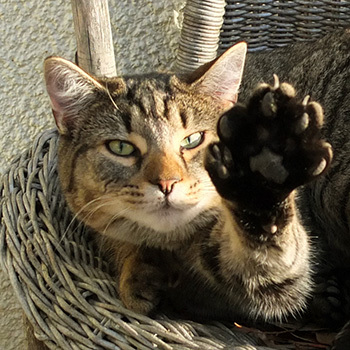 My cats spent many peaceful moments in the sun, snug and secure on their outdoor chairs. 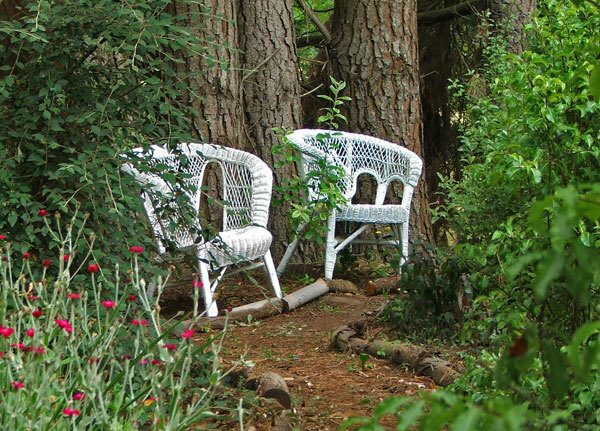 A pair of white cane armchairs used to look so groovy in the Hump, their evocative elegance a wonderful contrast with the rough pine bark and the surrounding wilderness greenery. Well, that's what I thought. Then one day I noticed. One armchair had completely disintegrated, while the other, leaning rakishly against the pine tree, had lost its bottom. Oops. Not the look I was after. So off they went to the bonfire. Then there was that huge cane chair dumped on the side of the road in a rubbish pile. Dumped for good reason, and I should have known that. But I stuffed it into my tiny car and drove it home, smiling all the way. Well, wouldn't you know it! The only cane furniture which has lasted is a set of chairs and a wee table which live a sheltered life on the verandah of Pond Cottage. My cottage cat, grey Minimus, considers them hers - as well she should. The chairs - perfect for a sunny afternoon snooze, or when she needs a good vantage point. The table - excellent to lurk underneath, should an interloper (cat or dog) dare to come too close. The top of a chair - just the right height from which to launch herself into the cottage window. The chair legs - multiple deluxe cat scratching posts. And pretty blue cushions, for sublime cat comfort. All that's missing is a sign saying 'Keep off'.